Fear is a film from 1996 with a two young actors getting their start in the movie business. I think both of them have done pretty well since this film. Mark Wahlberg was more well-known for being a rapper at this time then an actor. This was his first starring role after having a few supporting roles. Reese Witherspoon had a few starring roles under her belt by this time, but most where in low-budget films. This was these two stars introduction to most film goers. Our two stars were put in pretty good hands with James Foley directing, coming off directing an all time classic Glengarry Glen Ross. Foley has had a pretty good career in the thriller and neo-noir genre. With some classics under his belt and a few misses this one falls somewhere in-between. We also have veterans William Petersen and Amy Brenneman playing Witherspoon’s parents. Alyssa Milano who had already been in the spotlight quite a bit by this time in her career stars as Witherspoon’s best friend. Fear starts out with our two best friends accompanied by their male friend to a coffee shop in the wrong part of town. This is where Wahlberg catches her eye. We soon realize that Witherspoon lives in an overprotective house while her best friend runs free. Wanting a taste of her friend’s freedom, she soon joins her to go to a party. Here she meets and talks to Wahlberg and after a fight breaks out and the police come in, Wahlberg is her knight in shining armor as he leads her out of the mayhem to safety. A young romance starts until Witherspoon sees a side of Wahlberg that scares her. He is violent and bets up her male friend out of jealousy. This starts a chain of events which pits Witherspoon’s father, played by Petersen and Wahlberg against each other for the love of Witherspoon. I really liked this film when I watched it back in the 1990’s and after re-watching it I still do. After revisiting it, I can see glimmers of greatness to come. I thought Wahlberg was great as the psycho boyfriend and have always enjoyed his work. Witherspoon shows her charm and you easily side with her in this film. I also thought Milano was great as wild and free friend that makes some bad choices. Petersen is always good in these thrillers as the average joe that rises to the occasion. This film is worth watching for fans of Witherspoon, Milano and Wahlberg. It is also a must see for fans of Foley. If you are looking for a modern noir thriller it is worth a look. 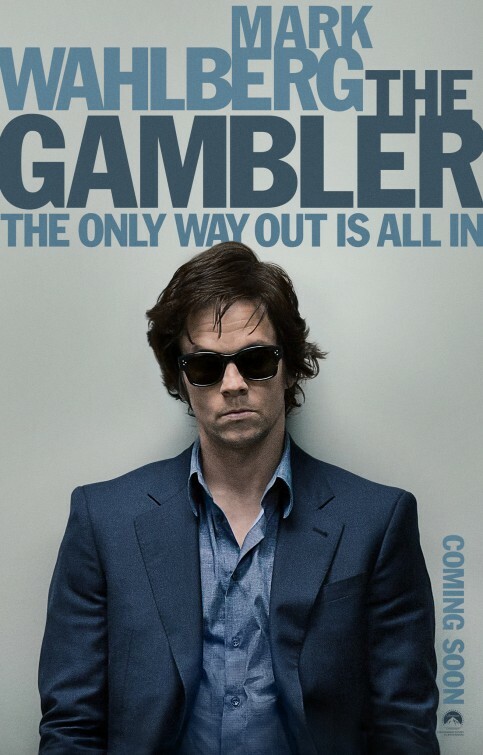 The Gambler is a neo noir film from last year and I was finally able to see it on Blu-Ray. The reviews are a mixed bag for this film. I got to say I really enjoyed it. I loved the noirish cinematography, the story and the performances. Reading some of the headlines for the negative reviews for this film, mention how it don’t stand up to the original. I’m the first to jump on the” re-make is unnecessary” camp and understand where these people are coming from. I, unfortunately have never seen the original(though I hope to someday) so I went into this film with no preconceived idea of what to expect. Maybe this is why I enjoyed it so much. This film is based on the original screenplay by James Toback and tweaked for a new generation by William Monahan who has done some great neo-noir and crime films. The film is directed by Rupert Wyatt. This film stars Mark Wahlberg as our anti-hero main character. He is a writer and a professor, but that is second to being a gambler. We also have Jessica Lange as his mother. Brie Larson as his brilliant student and his romantic interest as well as perhaps his saver. We have Michael Kenneth Williams and John Goodman as opposing gangsters. We also have Williams’ co-star from The Wire,Domenick Lombardozzi, showing up as Goodman’s top henchman. Our story starts with Wahlberg gambling in a Korean gambling den. He is playing blackjack and doing very well at first, he then loses. The Korean’s want their money, Williams offers Wahlberg $50,000 to try to get even, he doesn’t. He then goes to Goodman for a loan. Goodman reminds him that Williams will kill him if he doesn’t pay back his debt. We then find Wahlberg at his day job as a professor. We take off from there as he juggles his debt, his family, and his class of students. I really liked the neo noir filming style in this film. One of the things you will notice while watching this is each person our protagonist owes money has their own color,the Korean’s color is green, Michael Kenneth Williams’ gang has the color black and John Goodman’s color is red. I first picked upon this in the scene where Wahlberg is waiting to be picked up by Lombardozzi. I noticed all the cars are white, grey and black in a wash of Land Rovers and BMW’s we see Lombardozzi pull up in a bright red Porsche Cayenne. There are a lot of beautiful noir like scenes in this from the smokey gambling halls, to a grayed out class room, to the neon lights of a casino. I also loved the soundtrack for this film and how it was used. Also pay attention to Wahlberg’s suit throughout the film and how it changes. Like I said, I really liked this film, but I have not seen the original. I think if you go into this with fresh eyes and do not compare it to the original you may enjoy it too. I would love to hear from those lucky enough to see both of these films and what your thought on both are. Favorite tidbit: Mark Wahlberg dropped 61lbs for his role going from 198lbs to 137lbs, to show the characters lack of caring about his health and well-being.